Often when I start researching a person I have enough information to find out some of their basic demographic information. Details such as the neighborhood in which a person lived, his or her occupation (or that of the parents), and the size of the family give me a clearer picture of what the individual’s everyday life might have been like, helping me create these life and death stories. Unfortunately, this entry was all I could uncover about Walter Luther. The majority of the children’s entries contain at least the parents’ names, which makes me wonder if Walter was an orphan or if the omission of his parents’ names was merely a clerical error. No place of death was listed either, so there’s no way to know if he died in a home, a hospital, an orphanage, etc. There weren’t even any matching results in the birth and death indexes for Virginia. He was buried on promiscuous ground, not in a family square. Aside from the entry in the mortuary records it seems as if Walter Luther never existed. I have not seen a grave marker for him, but I will continue to look. Hopefully there will be something permanent to serve as a memorial, but I won’t get my hopes up. Walter was the only person reported as dying from “gangrene of the mouth” in the Mortuary Reports between 1883-1895 (for the months available).3 The word “gangrene” elicits an almost visceral response of disgust. Images of the mortification of tissue, darkened, blackened, rotting flesh on an otherwise living body-it’s not a pleasant mental image. Now imagine something similar on a child’s face. 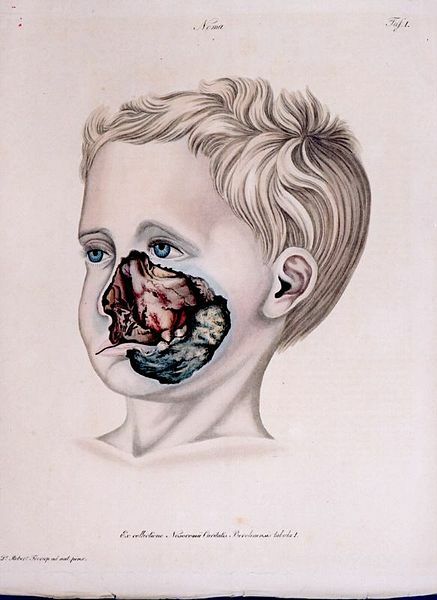 In the 19th century gangrene of the mouth was used synonymously with the terms cancrum otis, ulcerative stomatitis, and noma.2 It mainly struck impoverished children who followed poor hygiene practices who had recently had another illness such as typhoid fever or measles.4 I can only speculate that Walter lived in poverty without access to safe drinking water and healthy food. He had probably been ill with some other life-threatening disease just prior to developing gangrene. His final weeks or days on Earth were probably spent in agonizing torture as his condition worsened. The combination of a weakened immune system, inflammation or an ulcer inside the mouth, poor diet, and inadequate sanitation created the perfect environment for gangrene of the mouth to develop. Once it had spread to the cheek, a purple blister formed underneath the skin which would turn black, finally resulting in an eschar. After the eschar had sloughed off, the bone and gums could be exposed. Necrosis of the maxillary bone was common.4 This would cause the teeth to fall out because there was nothing to anchor them, but tooth loss was probably the least of a list of concerns for someone whose face was rotting away. Towards the end of his struggle with gangrene, little Walter probably experienced delirium, anxiety, cold extremities, an unusual pallor, and putrid breath in addition to the pain resulting from his condition.4 Death from gangrene of the mouth was usually the result of pyemia (blood poisoning from the absorption of pus) or lobular pneumonia (broncho-pneumonia1. So sad. What an terrible way for a young child to pass. I always find your posts fascinating. Also I would like to thank you for linking up with Ceemtery Sunday this week, but I am unable to comment on the actual post. Anogther fascinating story. Thank you. Thank you for reading and hosting the link-up! Fascinating story, poor little mite. Next Next post: "Drowning…at the Hands of an Insane Mother"